China's exports rose more than expected in August, adding to hopes that the world's second-biggest economy may be recovering from its recent slump. Shipments rose 7.2% during the month, from a year earlier. Most analysts had expected a figure closer to 5.5%. The export and manufacturing sectors are key drivers of China's economy - which has seen slower growth recently. Analysts said the latest data indicated that growth was starting to pick up. "China's August trade sustained the upward trend seen since July, in line with accelerating growth momentum and improving market sentiment," Liu Li-Gang and Zhou Hao, economists at ANZ said in a note. They added that the figures pointed to an "upside bias in the third quarter gross domestic product (GDP) growth". Imports rose a less-than-estimated 7% from a year earlier, resulting in a trade surplus of more than $28.5bn (£18bn). 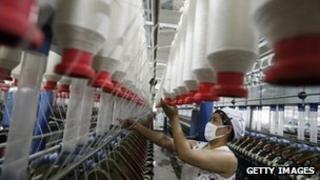 China has taken some steps in recent weeks to try and boost its manufacturing and export sectors. Last month, the government suspended value-added tax and turnover tax for small businesses with monthly sales of less than 20,000 yuan ($3,257; £2,125). It said the decision would benefit more than six million small companies and boost employment. At the same time, it said it would simplify customs clearance procedures, cut operational fees and facilitate exports of small and medium-sized private enterprises. Analysts said that an economic recovery in key markets such as the US as well as a recovery in demand from Asian economies had also helped China's exporters. "Better exports in July and August reflect improving external demand," said Joey Chew, an economist with Barclays. "We think that the global economy is heading for a modest recovery in the second half of the year and that will help further sustain growth in China's exports." Meanwhile, data released on Monday showed that China's inflation rate was little changed in August. Consumer prices rose 2.6% during the month, from a year earlier. That compares with a 2.7% increase in July.